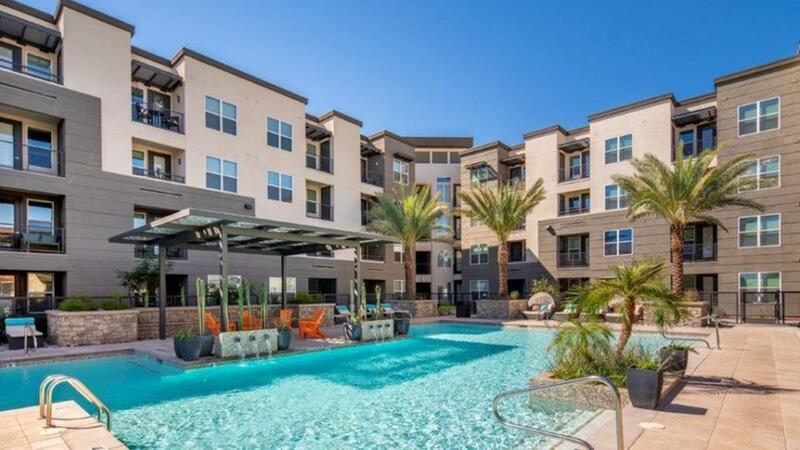 Welcome to the Flats at SanTan in Gilbert AZ! We are thrilled to welcome the Flats at SanTan in Gilbert, AZ to the Weidner family. Flats at SanTan offers one and two bedroom apartments for rent ranging from 601 to 1,374 square feet with amenities reminiscent of a full-service desert resort. From the luxury pool and spa to the resident clubhouse with On-Demand technology, Flats at SanTan caters to the active, outdoor lifestyle. Grab your yoga mat and enjoy the outdoor yoga station or try out some new recipes on your friends and neighbors at one of the grilling stations. This is outdoor living at its best at Flats at SanTan. Inside, residents enjoy a new level of desert chic with expansive floor plans featuring a bevy of designer extras. These generous floor plans are perfect for entertaining or enjoying a quiet evening at home. Gourmet-style kitchens include stainless-steel appliances, granite countertops, and custom cabinetry with designer pulls. An in-unit washer and dryer and spacious walk-in closets cater to residents’ need for upscale convenience. Designer extras include framed mirrors, an updated lighting package, and garden-style soaking tubs. Pets are welcome at Flats of SanTan and though we haven’t asked them – we’re pretty sure they enjoy the on-site dog park and pet washing stations where they can get a quick cooling off after their playdate! Gilbert, AZ is just 22 miles outside of Phoenix and features a variety of things to do, see, and taste. Flats at SanTan is within walking distance of SanTan Pavilions and SanTan Village Mall is just across the street and features such national brand stores as Macy’s, Dilbert’s, and Barnes & Noble. After their shopping excursion, residents can choose from fine dining to meeting up with friends and checking out the latest movie. Downtown Phoenix and Scottsdale are a short drive away and offer even more choices for dining, shopping, and entertainment including a myriad of resort golf resorts and the picturesque trails of Camelback Mountain. Major employers also make their home in nearby Phoenix and the surrounding area including the State of Arizona, Banner Health, City of Phoenix, Maricopa County, and Wells Fargo. The upscale amenities package combined with the best of all locations – it’s no wonder we’re excited to welcome the Flats at SanTan to the Weidner family! From Studio to One Bedroom Without Moving! Renting vs Buying: What is Best for You?